The bramble currant is a shrub with conspicuously bicoloured (two-coloured), bramble-like leaves which make it easy to identify. This plant was previously known as Rhus batophylla. Searsia batophylla is a low-branching shrub up to 2 m high. 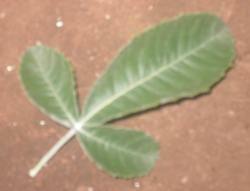 Leaves are usually trifoliolate (with three leaflets) and usually with a petiole (leaf stalk) which is variable in length within the species and folds upwards along the main vein; the leaflets are greyish-green above and whitish below. The shrub produces tiny masses of flowers at the tip of the branches from November to March. The fruits are dark red drupes (indehiscent, usually one-seeded, fleshy fruit as for example plum), sometimes resembling raisins. The bramble currant is listed as Vulnerable. It is endemic to the moister Drakensberg mountain areas in Limpopo Province. Its population decrease is due to mining, overgrazing and human settlements in its natural habitat. Searsia batophylla is endemic to Sekhukhuneland, including the Steelpoort and Burgersfort areas, in Limpopo Province. The old genus name Rhus refers to the reddish young and autumn leaves in some species. The specific epithet is derived from the Greek batos, bramble, and phyllon, leaf, referring to the bramble-like leaves. Searsia is a large genus of approximately 200 species of trees and shrubs occurring in tropical and subtropical countries. The genus can be confused with Allophylus, another genus with trifoliolate leaves. Allophylus species, however, may have hairy pockets in the axils of the veins on the underside of the leaves and the flowers are in a spike-like inflorescence in the axils of the leaves. The plants are pollinated by small insects. The leaves of the bramble currant are browsed by goats and sheep, and the fruits are eaten by birds. The wood is used for firewood in the rural areas, where it grows in masses. The plant is easily propagated from fresh seeds sown immediately after harvesting in a mixture of 1 part loam soil, 2 parts compost and 1 part river sand. Keep the growing mixture moist at all time. Hardwood cuttings can be used if taken in winter from June to July and planted in 2 parts washed river sand and 1 part compost. Moffett, R.O. 1990. A taxonomic study of Rhus (Anacardiaceae) in South Africa. Unpublished PhD Thesis, University of Stellenbosch. Schmidt, E., Lötter, M. & McCleland, W. 2002 Trees and shrubs of Mpumalanga and Kruger National Park . Jacana, Johannesburg.